The MySpy™ WiFi Messenger indoor alarm system monitors and reports any residential alarm condition (contact closure), including sump high water level or over/under temperature alarms. When the contact closes, the alarm notifies the user both locally (audible and visual alarms) and remotely via SMS text messages and/or emails to a smartphone, tablet or computer using the existing WiFi network (or Ethernet). The alarm will notify up to four contacts (two email, two text contacts) for alerts, including alarm, power lost, power restored, low battery and alarm offline. The MySpy™ WiFi Messenger alarm does not rely on cellular service, so there are no contracts to sign or monthly fees to pay. The MySpy™ WiFi Messenger alarm features a NEMA 1 rated enclosure for indoor use, automatic alarm rest and 9 VDC battery backup with low battery chirp. The touch pad includes test and silence buttons for the alarm horn and LED indicators for alarm (red), power on (green) and network status (blue). The WiFi Protected Setup (WPS) push-button simplifies network connection (Ethernet may be used, cable not included). Auxiliary alarm contacts are included for attaching remote devices. Optional float switch models and splice kit are available. 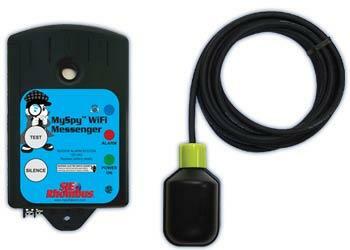 The MySpy™ WiFi Messenger alarm system is CSA Certified and backed by an industry-leading five-year limited warranty.